According to Wikipedia, Mentorship is a personal developmental relationship in which a more experienced or more knowledgeable person helps to guide a less experienced or less knowledgeable person. However, true mentoring is more than just answering occasional questions or providing ad hoc help. It is about an ongoing relationship of learning, dialogue, and challenge. So how and where do you learn about becoming a mentor to someone? Here are some resources below. 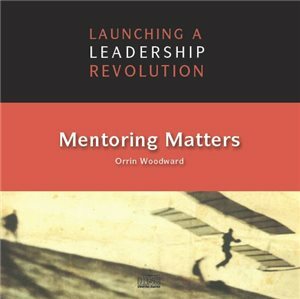 Orrin Woodward‘s latest book, Mentoring Matters, from the LIFE Leadership Essentials Series, exemplifies the importance of having a mentor in life. There is no end to what can be achieved with an effective mentor. Excellent mentoring is the natural result of learning the important lessons of life and then caring enough to help others learn them as well. Great leaders, and those who are seeking to become great leaders, are constantly improving their mentoring abilities. Being responsible for the way we treat others is one of the most important steps to self-mastery and personal excellence. Great mentors don’t let the advice of the doubters stop them from listening to and following the wisdom of doers. Mentors are supposed to help the mentee find his path and then push and guide him to fight for his success. Once mentors and mentees have established a concrete and worthy goal, the second step to creating the environment for the success is making that goal totally achievable. One of the joys and excitements of mentoring is discovering the particular brand of genius each mentee possesses and finding the best way to bring it out. As a mentor, when you see a problem, deal with it immediately. The LIFE company also produced a great cd that I highly recommend called, Mentoring Matters. I love this cd, especially since making it my passion to help others achieve their full potential in whatever they endeavor to achieve. In Mentoring Matters, Orrin Woodward offers wise advice on how to achieve true greatness and become an amazing mentor who guides others to do the same. Life’s struggles are never easy, but everyone has them. Many people think the top leaders made it to the top with ease—not true! Leaders make it to the top because they never give up on their dreams. Greatness is forged in the fires of struggle. Don’t make excuses, they only please those who make them, and the more of them you make, the less success you achieve. Take responsibility for your own life and look at every situation as a teachable moment. If you were lucky enough to have a good mentor, then pay it forward and become a beacon of light for someone who has been living in the dark. Be a leader and become a mentor to someone you know. Leave a legacy! Our nation needs more great leaders and those that will stand up and take responsibility for our future. If you don’t, who will? Lead on!